Luxurious appartment in the city centre of Plzeň. There are both bathutub and shower in the bathroom. 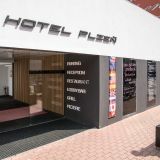 Appartment is situated in a hotel Plzeň. There is restaurant and café at the building and italian restaurant close by.